Henry Garcia-Alvarez is a fifth generation Californian. Growing up in the rich agricultural region of Visalia California, he worked beside his grandmother, and his aunts and uncles learning the traditional wisdom of plants and the practice of sustainable agriculture. Henry has earned a master’s degree in International Agriculture Development from University of California at Davis. He has studied with Bill Mollison and is a Certified Permaculture Designer. Henry pursued his interest in herbal medicine and is certified as a Wholistic Lifestyle Pastoral Counselor and Herbal Consultant from world-renowned herbalist Candice Cantin. He is also a graduate of the Herbal Apprenticeship Program – Western Herbology with another world-renowned herbalist, Kathy Keville and was her class assistant for two seasons. 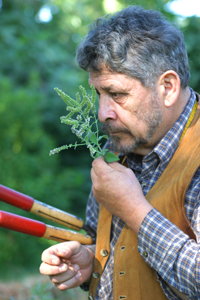 Currently Henry has been certified as an Herb Information Specialist with the American Botanical Council and is participating in the Yolo County, California, Master Gardner Program. Consulting internationally in agricultural development, Henry has taught Urban Forest Management in Azerbaijan, a workshop creating value added products from herb production in the Darien, Panama; assisted Candice Cantin consulting in medicinal plant identification and education in Kyrgyzstan, and consulted on farming techniques for the successful production of organic Oregano as a commercial crop in Paraguay. This photo is from their Community Garden near the UCD Student Farm on the UCD Campus. In the Russian River area of Sonoma County, Henry established a garden which later became the herb garden site for herbalist Rosemary Gladstar’s Herb School at Emerald Valley, Forestville, California. As the Stewardship Coordinator for the Sacramento Tree Foundation, Henry developed a tree care protocol and created measurement standards now being used by Tree Programs in the United States. Henry and Jill checking the weather. At home in Bryte California, Henry and wife, Carol tend a 3/4 acre garden of mixed fruit trees, vegetables, medicinal teas and aromatic plants. Henry and Carol have been gardening together for 15 years. They produce over 60% of their food and make all of their herbal remedies. They also grow medicinal herbs on their 5-acre farm in Yuba County California. The herbal teas and the Hydrosols which Henry distills are available under the label of Henry’s Hillside Herbals.